@DarrenRovell / TwitterPhil Mickelson has been turning heads all season with his choice of golf attire thanks to his latest sponsor, and now he’s dancing in a new commercial for the upstart brand. 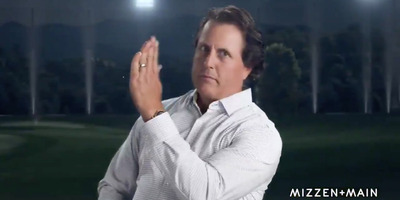 The brand’s first ever television commercial stars Mickelson as he dances on a driving range, dodging golf balls and showing off the mobility allowed by his dress shirt. Phil Mickelson isn’t done turning heads with the help of his latest sponsor, Mizzen+Main. The brand, which sells breathable performance dress shirts, has been a staple of Mickelson’s look during the 2018 season, with the five-time major winner often sporting button-up dress shirts alongside his opponent’s noticeably more athletic-looking attire. Now, Mickelson has taken that commitment to a new level, appearing in Mizzen+Main’s first ever television spot, showing off his dad dance moves while dodging golf balls shot in his direction. Buzz started when Mickelson debut the shirt while playing a practice round with Tiger Woods ahead of the Masters. Since then, Mickelson has been light-hearted about embracing his role as the brand’s spokesman. It’s no surprise that Mickelson would so fully embrace the new brand – his deal with the company reportedly included an undisclosed ownership stake. Mickelson also has sponsorship deals with KPMG, Callaway, Workday, Rolex, and more, but don’t expect to see him dancing in their commercials any time soon.